BELGRADE – In a phenomenon that people are calling “Grumpymania”, the streets of the Serbian capital are abuzz with spirited grumbling and complaining. The weather, for many is too cold. The shopkeepers, for others, are too rude. 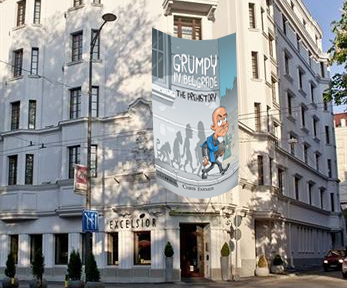 Slow waiters, idiot drivers, and robotic postal workers are under siege in Belgrade as #Grumpymania sweeps the nation. Since the announcement of the new book, Grumpy in Belgrade: The Prehistory, coming out on December 23rd and being launched at Restaurant IVO in the Belgrade Excelsior, Belgrade’s main pedestrian areas are being populated with cantankerous and carping curmudgeons – people who were, up until recently, decent law-abiding citizens. Footage and still photos of individuals who have shaved their heads and put on Nehru jackets have been collected and distributed through a newly inspired underground media. We will share the images as they become available. Grumpymania has resulted in a discernable rumbling of the words Ne and Nema, making Knez Mihailova sound more like a goat pasture than a shopping street to the uninformed passerby. The underlying fever of this frenzy is in the competition to be the first to get the new Grumpy book. Still a week away, people are starting to line up in front of bookshops and in front of the Excelsior. Incensed, a huge crowd of head-shaven grumpies sat down as one in a nearby café. Pulling out computers and notepads, they did what Grumpymania drives them to do. This entry was posted in Essays and tagged bald, book, Chris Farmer, competition, complaining, Excelsior, Grumpy in Belgrade, Grumpy in Belgrade: The Prehistory, Grumpymania, launch, Restaurant IVO, The Standard Deviation. Bookmark the permalink.